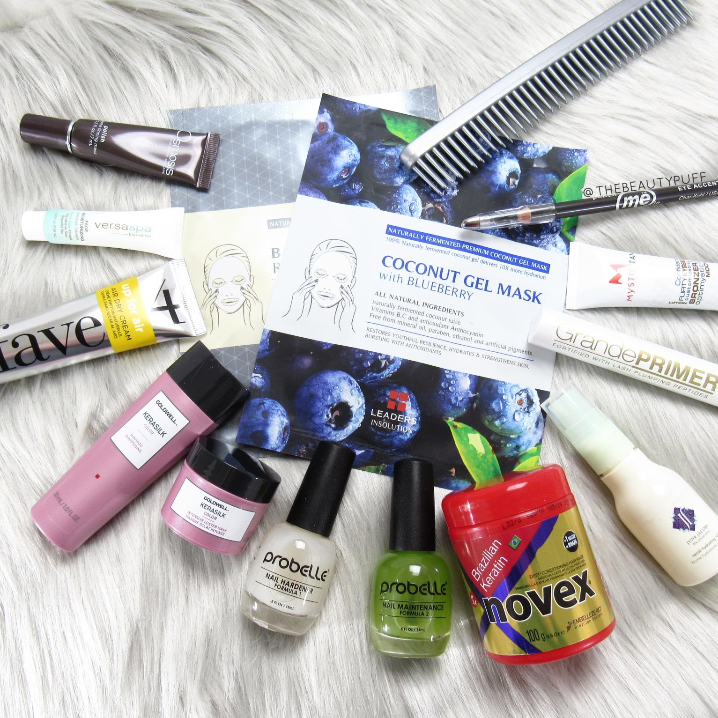 NewBeauty TestTube is a bi-monthly subscription service that includes the latest in haircare, skincare and makeup. Samples are both full and deluxe-sizes. Sometimes there are brands I've enjoyed in the past but many times they introduce me to new favorites! Let's have a look at this month's TestTube. Goldwell Kerasilk Shampoo & Mask | These products combine the nourishment of keratin and the benefit of color protection. There are no harmful sulfates so hair is protected from damage and color will stay vibrant longer. fave4 Up For Air Air Dry Cream | A product that lets my hair air dry? Yes please. This cream helps reduce frizz and keep hair hydrated so you can let it dry naturally. There are no parabens or sulfates - bonus! Leaders Cosmetics Masks | TestTubes this month will contain one of these masks, though somehow both got tucked into my box. The Balancing Recovery Mask will surely be my favorite because it works to balance oil, shrink pores and calm skin. The Coconut Gel Mask provides anti-aging benefits to promote glowing skin. Both masks feature natural extracts and work in 10 minutes. Pencil Me In Cosmetics Natural Eyeliner | This eyeliner features natural ingredients such as green tea, grapeseed extract, shea butter and vitamins. The formula is smooth and pigmented and the cap features a sharpener so you'll always have one with you while traveling. Osmosis Skincare Polish Enzyme Firming Mask | I love Osmosis Skincare products so this was a great surprise in this month's selection! This mask rids the skin of dead skin cells, blackheads and uneven pigmentation. Key ingredients include Lactic acid, cranberry and CoQ10. Mystic Tan Bronzer Lotion & VersaSpa Gradual Face Tanner | For that sun-kissed glow without the sun, these products build a tan over time and hydrate the skin. I've tried both these brands before so I'm happy to have even more samples to enjoy! Denman D12 Three-Row Comb | Voluminous hair can be achieved in a pinch with this multi-tasking comb. You can back-comb any section of hair for instant lift. The multiple rows also help to make detangling a breeze. June Jacobs Neroli Hydrating Mist | I've been using facial mists a lot over the last couple months. They're an instant pick-me-up with the added bonus of hydration and nourishment. This particular facial mist has neroli from the bitter orange tree, green tea, goji berry, pomogranate and grape seed extracts. Novex Keratin Hair Cream | I've used this hair mask before and I really like it. You just leave it in your hair for about 15 minutes after shampooing and rinse out. It's an easy step to achieve stronger, silkier locks. Probelle Nail Hardener & Nail Maintenance | I'm all about nail treatments to help my nails grow longer and stronger. The nail hardener in this system focuses on repairing weak nails and the nail maintenance formula uses garlic and lime to maintain strength and growth. My nails definitely needs some tlc so I look forward to trying these out. GrandePRIMER | This brand has been featured in TestTubes previously so I recognized it right away. This primer is full size which is fabulous. It goes on white and helps with length, thickness, and strengthens lashes over time. I can't wait to use this with all my favorite mascaras to give them a boost! NewBeauty TestTubes are $29.95 each and include 8 or more products. Subscribe below!